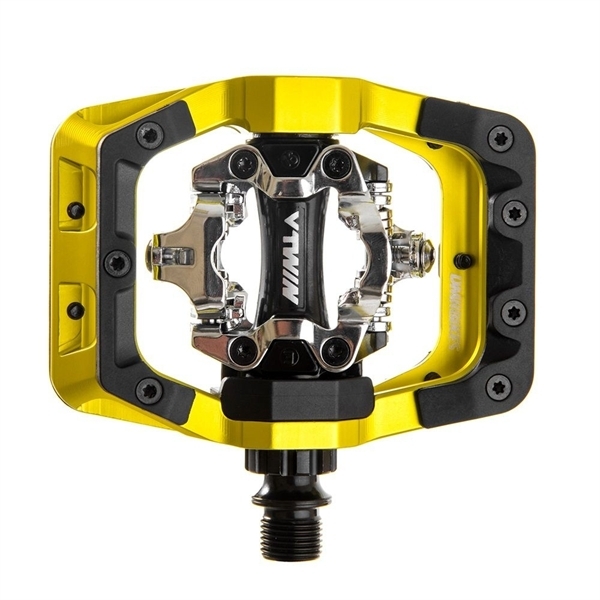 Product information "DMR V-Twin Pedal - lime"
Equip your bike well with the MTB pedals V-twin from DMR Bikes! The newly developed Caged-Clip system is based on the well-known SPD technology. In addition, the DMR V-Twin mtb click pedal offers a variety of different grip and feel options. The driver experience is enhanced by the so-called metal shim function. Using the pins in combination with a nylon "bumper", the pedal can be easily adjusted. Thanks to an extruded and CNC machined DMR Alloy cage with fully sealed (fully serviceable) bearing system, the V-Twin pedal can be used in the toughest environments while keeping the weight low. Adjustable platform height with nylon bumpers, footpegs. Similar to other pedals that use this system, the DMR V TWIN has a constructed float that allows the cage to move freely in adverse weather conditions. " Related links to "DMR V-Twin Pedal - lime"
Customer evaluation for "DMR V-Twin Pedal - lime"